Geez sometimes when I take on projects that I know are time consuming I get started and half way through I question why I took it on, LOL but it is always worth it. I am in love with my fabric, it is so gorgeous and this pic does it no justice. 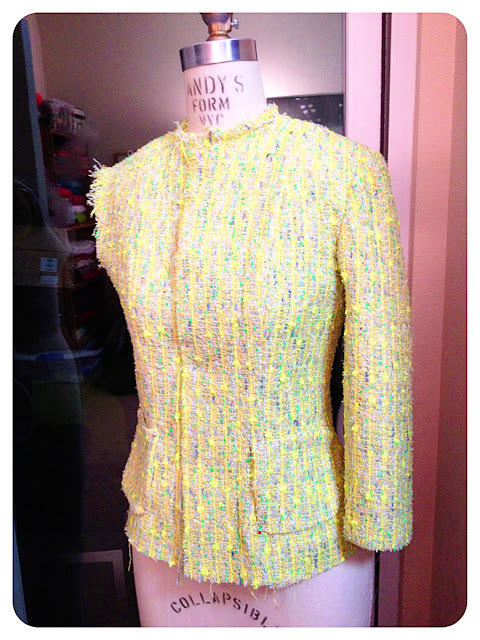 I went out looking for a matching trim for this "Chanel" style jacket but I just couldn't find one so now I have added more work for myself because I have to make the trim by taking apart the fibers and creating some braiding. Here are some pics of what I have done so far, I cut the fabric and lining pieces together so I laid my fabric down and then laid my lining over it and cut out the pieces one at a time. I also interfaced them because the weave in my fabric was REALLY loose and even with the lining quilted and working as the interfacing it still wasn't enough. 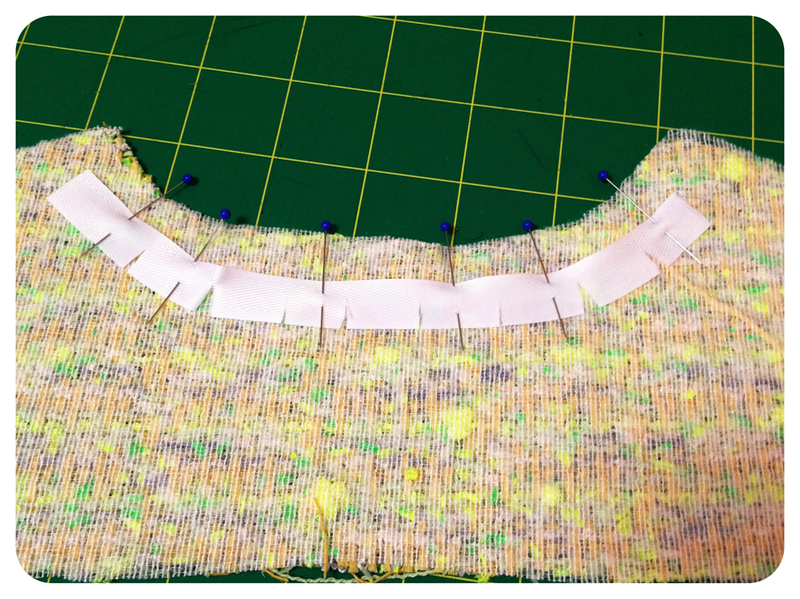 The good thing to interfacing my pieces it that it helps with fraying. I have one sleeve fully done and just need to do the other one, hand sew the pockets on to the jacket (they are just pinned right now) and then I will hand sew the front, hem and neck edges; then I can start making my trim, wish me luck. I need a few more days to get back to this one, lol sometimes you gotta let simmer for a day or two. Mimi, that fabric is gorgeous! This is a labor of love that will definitely be worth it in the end. I love your Chanel-esqe jacket. I have one planned to add to my wardrobe but have been putting it off because of the work involved. I may just have to dive in and do it. Great job! Wow, that sleeved side looks so wonderful! Thanks for comment on my blog? I love my skirt! 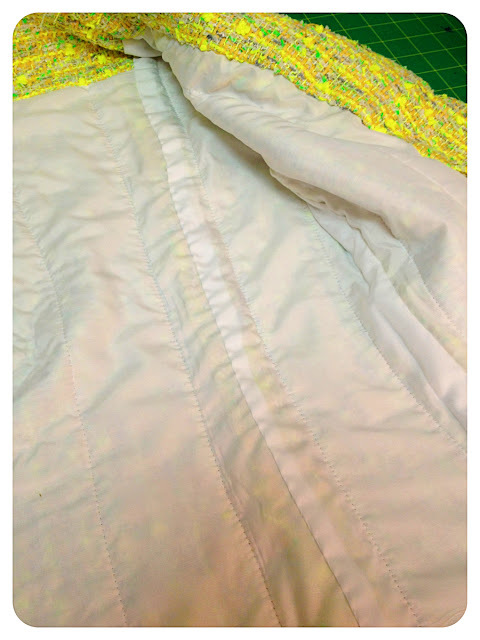 Mimi, your finishing / detailing are exquisite; like DaResInt1 noted it was hard to determine how and where your seams were done (I guess that is where the quilting comes into play). Its either that I am too lazy or too busy but you have inspired me to start sewing again I have just been purchasing patterns but I have difficulty finding fabrics that I like here in Barbados to do what I want (not an excuse not to start but a deterrent). I have purchased all your patterns so far (again my lazy / busy nature I have not started to execute but I plan to). What I would absolutely love to see a tutorial of is that high waist pencil skirt OOP print pattern that you feature previous - I have been searching for a skirt pattern and I am in love with that. But do continue to the great work you are doing, you are truly and inspiration to me and I am sure to others who follow you and read your blog. May God continue to bless you and guide your path. Wow, Mimi...this is looking SO GOOD!! I so appreciate the construction detail and really look forward to seeing the finished work. I recall seeing a short tutorial video you made some time ago to make your own duct-tape dress form. Do you still have/use it? Was it worth the effort for you? 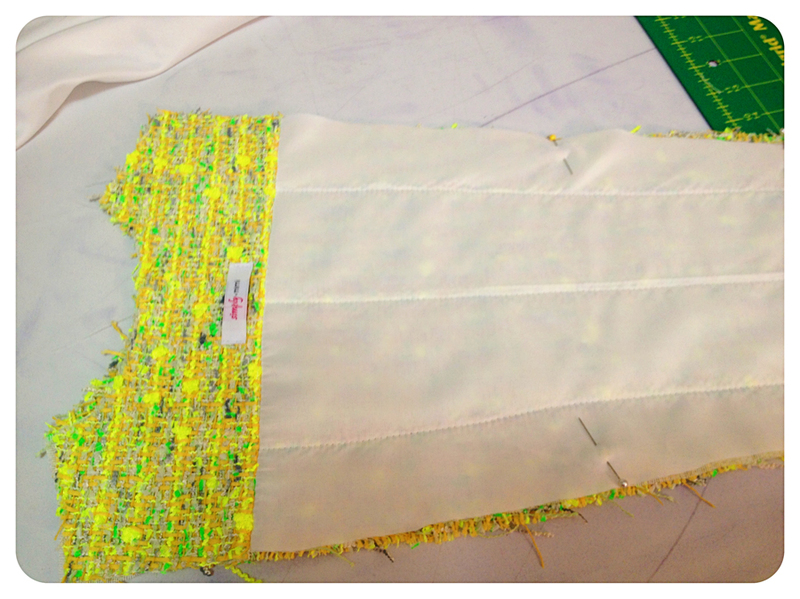 It is looking fabulous so far - are you enjoying the handsewing? Personally, I love it! Oh I so agree with you about taking on challenging projects! This one is definitely worth it by the look of your progress so far. Can't wait to see what you do with the trim! I love how bold the fabric is! I can't wait to see it finished and how you plan to make it one of your fabulous outfits! My fabric is cheap swap meet stuff, so it won't compare to your amazing fabric (see below). But, I'm still a beginning sewer and nervous to buy expensive stuff. It's like when I started to drive and didn't want to use my parent's new car, just the beat-up old one that didn't make me nervous! So far it's beautiful and the fabric is to die for. Can't wait to see the outcome! It's beautiful already! Love you attention to detail. I'm alaways in a rush, I need to relax and take it slow let it flow! The fabric is amazing, I aslo like how neat you work is. I love the photos! They are so helpful! I have this pattern and have read articles on the Channel construction -- I think I'm up to the challenge now! Thanks Mimi. 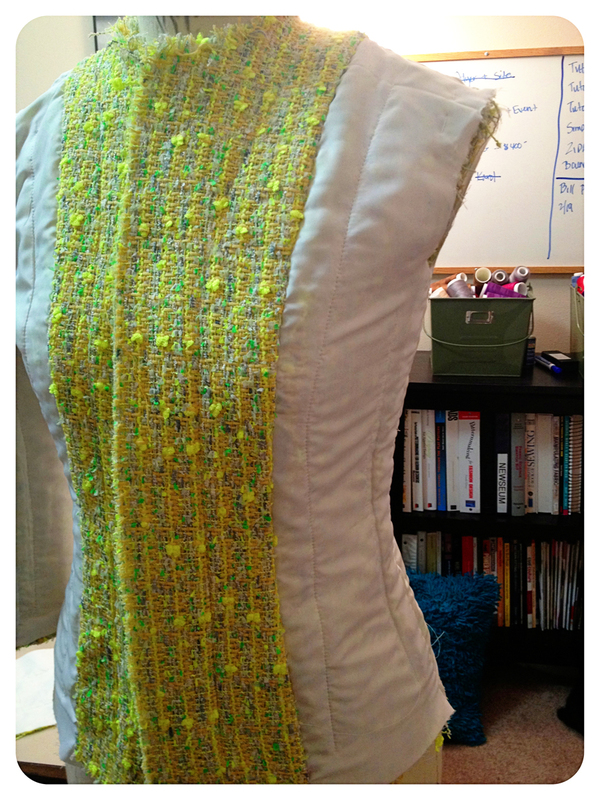 I can't wait to see your finished product -- the fabric is fantastic! Oh my goodness!! This is going to be so beautiful! I can't wait! The fabric alone has me drooling - not to mention all the couture details! I have had this pattern on my cutting table along with fabric, lining, interfacing, buttons, etc. for years. I am so excited to see your finished product...maybe this will finally push me along! Beautiful as with all your projects! I love the fabric. Can't wait to see the finished piece. I made a similar jacket from the same pattern. I found it was tough to take apart the scraps to make trim. Most of the fibers are not long enough to do much with. And I didn't have time to "unweave" alll that fabric. I used the fringed selvedge as trim and backed it with solid ribbon. The ribbon made the colors in the fringe pop. You could also look for yarn in those colors and braid that instead. It would be easier than taking apart all that fabric. Just a suggestion. The jacket looks great! You've inspired me again! I ordered the pattern and dug out my old Threads magazines with articles about Chanel jacket construction. I'm studying them until I get my pattern and fabric. I know it's going to take quite a bit of time, but I'm willing to invest time in a garment that will never go out of style. I can't wait to start! It's going to look so nice when your done. I wish I had your patience. 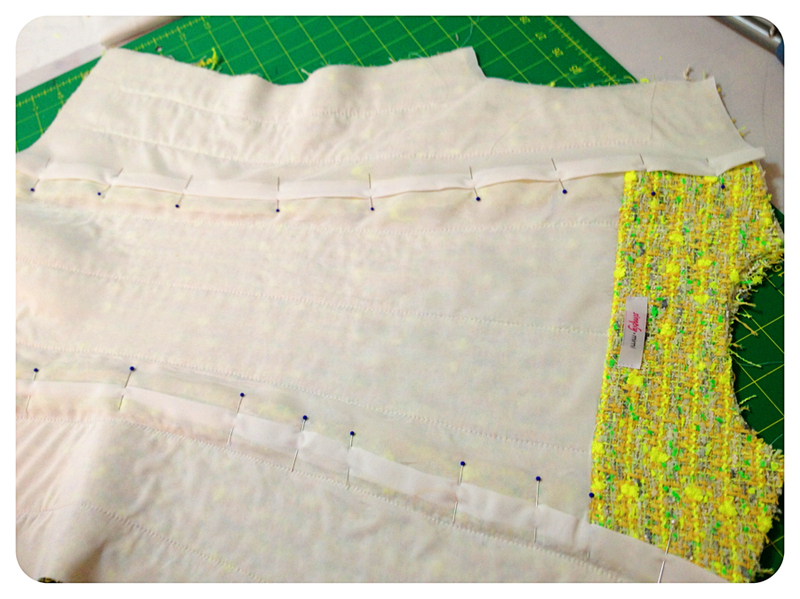 What is the purpose of the quilting? 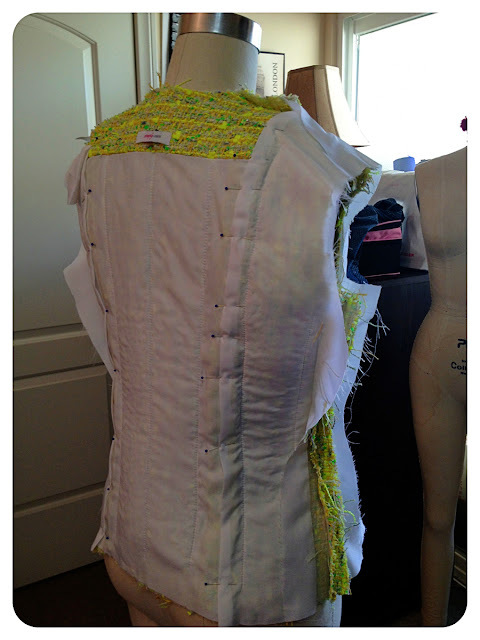 This is going to be such a great-looking and well-constructed jacket. 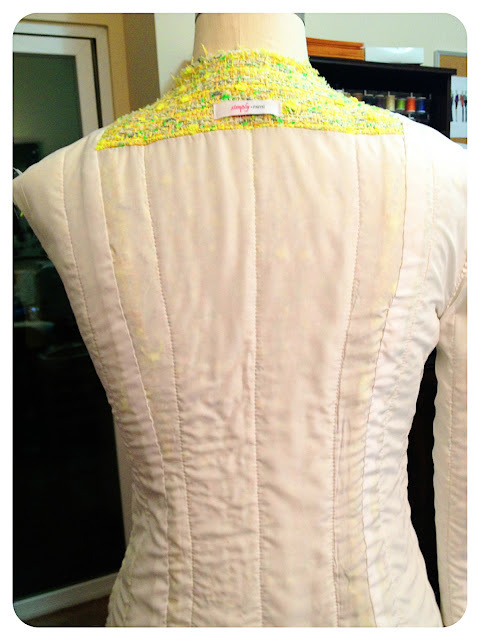 What is the benefit of hand-sewing the lining?